Sometimes the most basic techniques are also the most flavorful. Such is the case with pan-fried pork chops --- with minimal seasonings, these chops get their flavor from a pan-sear that results in a sweet, brown crust. Combine the flour, salt, and pepper in a large shallow bowl. Dredge each pork chop into the flour mixture to coat evenly. Shake off excess flour. Place oil in a large, heavy skillet and heat over high. When hot, add chops to skillet and cook 1 minute each side, until browned and crisp, working in batches as to not overcrowd the pan. I'd looked for the most basic pork chop recipe that gives the maximum flavor. And believe it or not I found it!! I made this for my kids, they loved them. I added a second dredge to them by dipping them in egg and them back in the flour mixture for extra crispy. These were really good, my boyfriend loved them. I added some extra spices to mine though, I added some garlic plus and veg spice just to give it a little more flavor. My 83 year old dad said this is the best pork chop he's ever had. I had to substitute breadcrumbs for flour. Average rating of 5.00 stars based on 5 reviews. Summary: Sometimes the most basic techniques are also the most flavorful. 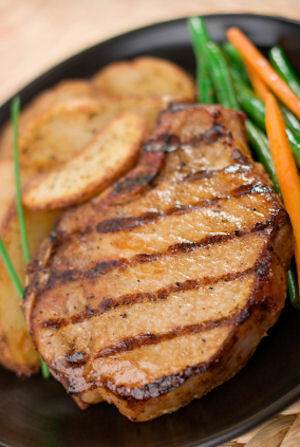 Such is the case with pan-fried pork chops --- with minimal seasonings, these chops get their flavor from a pan-sear that results in a sweet, brown crust.